We welcome everyone enthusiastically and earnestly to our church community. Regardless of background, age, race, gender, sexual orientation, ethnicity, having had Church experience or not. Regardless of where you are in your life journey, in your spiritual longing, or in your exploration of a community of faith- we welcome you! After you park your car you will see signs to lead you to the Church Street entrance to St. Peter’s. Enter through the red doors and you will find a greeter who will welcome you, give you a Sunday Bulletin, and answer any questions you might have. There is also a universal access entrance from the parking lot. Most of our services consist of spoken prayers, sung hymns and anthems, lessons from the Bible, a sermon, Communion, and the sharing of the peace. If you are unfamiliar with any of this, don’t worry, the bulletin will let you know when what is going to happen next. Most of what you need to know will be in the bulletin and the blue hymnal in your pew. All are welcome to join us for Communion at the Lord’s Table regardless of your faith tradition. If you have any questions, or need help finding something, please ask the greeters at the entrance to the church, or your neighbor in the pew. Your children are welcome to worship with us. After the reading of the Gospel, the young children may attend Children’s Chapel in the Smith room downstairs. They return to the service at the time of Peace. We hope that your children will participate in Children’s Chapel for younger children and Sunday School for school age children. Our Sunday School features “Godly Play,” a Montessori based approach to teaching Bible stories. At the entrance to the church we have bags with quiet activities for the children to use during the worship service. The bags contain coloring pages, books, crayons, and soft toys. Please join us for coffee hour after the 10 AM service. This will give you an opportunity to meet some friendly people and have refreshments with us. You will be given a “welcome” bag with information about our church. We would greatly appreciate your signing the guest book. 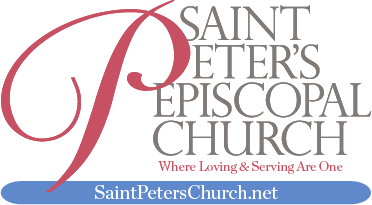 We hope you will make Saint Peter’s your new spiritual home! Worship is at the heart of our congregational life at Saint Peter’s. This weekly joyful celebration is centered on Eucharist. On certain special days of the year – Christmas, Easter, Pentecost, Patronal Sunday, and All Saints’ Sunday – we celebrate Eucharist with incense and bells. Our weekly Sunday services are often augmented by baptisms and seasonal importance of Advent, Epiphany, Lent, Easter, and Pentecost. Mid-Week Eucharist- Tuesdays at 7:00 p.m.
Often times, the sermons we hear on any given Sunday resonate in our minds throughout the weeks to come. Here you will find archives of the most recent sermons for your listening pleasure. Episcopalians take a global view, celebrate diversity, nurture those who seek, and view a spiritual journey as a communal activity. An Episcopalian is a member of a worldwide fellowship of Christians, drawn together by certain common beliefs: the authority of the Bible, the value of tradition and respect for reason. While traditional in its liturgy and worship (our Book of Common Prayer was first published in 1549), The Episcopal Church is modern in its practices and theology. We have always been at the forefront of social reform movements in the United States, such as opposing the death penalty, supporting the civil rights movement and affirmative action, and now calling for civil equality of gay, lesbian and transgender people. Women are ordained as bishops, priests and deacons. Thirty-four percent of our active clergy are women. Our presiding bishop (chief pastor to the Episcopal Church’s 2.4 million members in the United States) is Michael Curry. We are governed by Bishops ordained in an unbroken Catholic line stretching back to the apostles of Jesus Christ, and we are a part of the worldwide Anglican Communion led by the Archbishop of Canterbury. There are 80 million Anglicans worldwide from 44 branches of the Church in 165 countries. While hierarchical in structure, our church is democratic in its decision-making. Bishops, clergy, and lay persons gather together to make major policy decisions determining our future course and direction.